The blue-tinted dwellings looked like they continued on for miles. From high above the ancient Indian city of Jodhpur, it was easy to see how it became known as the "Blue City." Kristi Eaton spent a month in India as a fellow with the International Reporting Project - this is her story. I caught a view of these sky-blue homes while visiting the 15th century Mehrangarh Fort, which includes a palace, temples and garden at the end of a winding road looking down on the city. Though this was my first visit to India, my perspective on a month-long trip there was not entirely that of an ordinary tourist. I was traveling from one side of the country to the other, researching issues facing women and girls in Jodhpur. 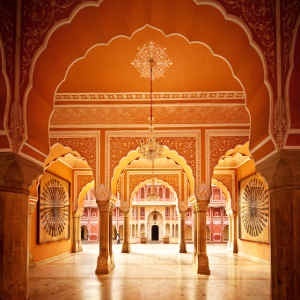 the Rajasthan State was on my itinerary because it is an area with high rates of female illiteracy, child marriage and a preference for male children. But in addition to my research, interviews and writing - I made time for sightseeing and experiencing local culture. At the Mehrangarh Fort, I stumbled across the Turban Gallery, which tells of the history, traditions and variety of turbans found in Rajasthan. I happened to be in Ahmedabad, located in the west- where I entered the country just in time for a wonderful annual spectacle known as the colorful International Kite Festival. In Jodhpur, I befriended a family who invited me to an extravagant Hindu wedding. I thoroughly enjoyed sampling the food and observing the ceremonies and splendid outfits. Even though I stayed near the family who invited me, being a solo Western woman at such an event did not come without stares and looks of befuddlement from other attendees. I had come to India to look at gender issues in this complex culture. Among other things, I visited a school for underprivileged girls, met female entrepreneurs and looked at a program that makes sanitary napkins available to rural women. But sometimes, it seemed I was as much an object of curiosity to locals as their culture was to me. One challenge for me was getting used to standing out from the crowd. In Ahmedabad on one of my first few days in India, I desperately wanted a cup of coffee before an interview. I was waiting for another woman who would help me translate at the interview and decided to head to a street vendor for a quick cup. I'd already drawn attention to myself, walking up and down the street looking for the translator and now I found myself the only woman among a throng of men. They seemed perplexed by my arrival but ended up helping me order the tiny coffee and left me alone as I sipped on a bench. I did not know Hindi or the local Gujarat language - so I didn't try to engage in conversation. But that feeling of standing out was something I had to get used to. Some days it was no big deal. Other days — when I felt responsible for keeping up a conversation, making sure I was safe and doing my best to be culturally aware while exploring sensitive subjects around gender inequality — was exhausting. Like many first-time visitors to India, I went to Agra to see the Taj Mahal and stopped at the Agra Fort. Not far from those attractions was another stop on my itinerary - the 'Sheroes Hangout'. Sheroes Hangout is a cafe run by survivors of acid attacks — women who were scarred in assaults stemming from family disputes, unrequited love or other conflicts. The cafe also features a small library and handicraft and exhibit space. Other Sheroes Hangouts are located in Lucknow, in Uttar Pradesh, and in Udaipur in Rajasthan — all with a goal of empowering women who might otherwise feel forced to hide their scars. I felt a bit shy about engaging the women in conversation on my first visit. On my second visit, I opened myself up and found they were eager to share stories despite a language barrier that kept the conversations basic. In the back of my mind, I could not help but think about some of the horrific assaults on women in India — both locals and tourists — that have made headlines. So I made very deliberate choices about my dress and behavior. I always wore loose-fitting pants, a T-shirt and often times a shawl-like cover up. I only had wine on one occasion and rarely stayed out after dark - unless I was with someone whom I trusted. Rather than taking long-haul trains on my own, I hired a driver to take me from one destination to the next. It was expensive but worthwhile for the ability to sleep, relax and work during the sometimes eight- to 12-hour trips. Within cities, I used auto rickshaws, cabs and services like Uber. I was never harassed but I did regularly receive stares — something that had not happened during trips I'd taken to other countries like Indonesia, Guatemala and Vietnam. In some small ways , my travels here had allowed me to experience some of the cultural attitudes toward gender that I'd come to research. - Is the Otter Trail really worth the year-long waiting list?